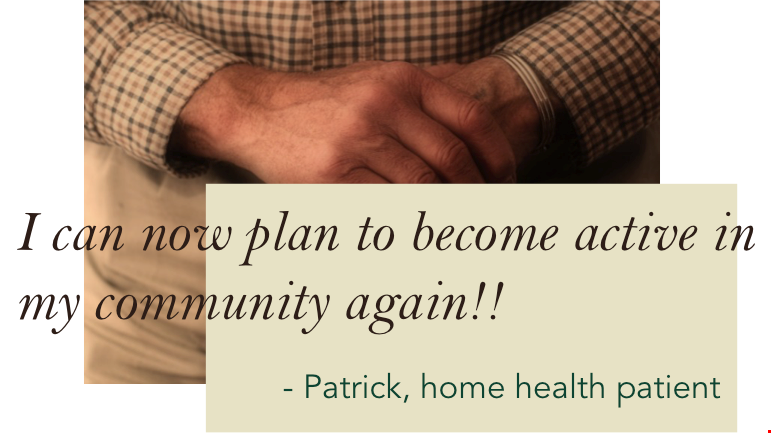 Patrick, a long-time Dubois resident, understands firsthand the benefits of skilled home health after a debilitating illness left him unable to walk or perform many of his day-to-day activities. Patrick recently shared about his experience with his physical therapist assistant, Melissa Gardner. 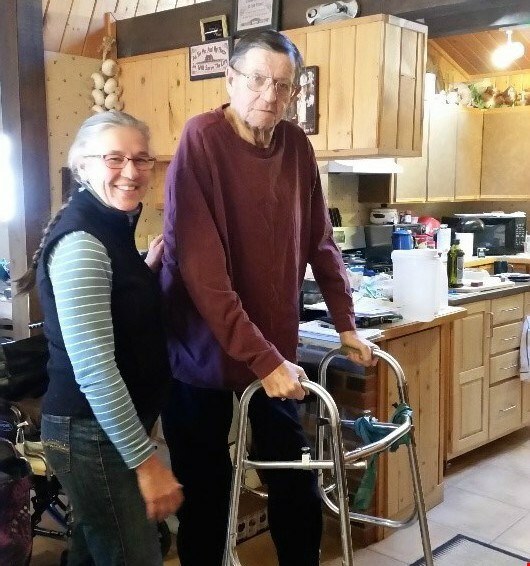 Why were you referred to Home Health? I was bed-bound and could not even roll over when I first came home (from the hospital). What have you experienced while you have been working with Home Health staff? Caring staff, challenging therapy sessions, and success all around. Now I am learning to walk with one crutch. How would you describe your care and therapy on Home Health? Excellent! I received encouragement to meet the challenges that are given to me and those challenges are always realistic and in my best interest. Margaret (Home Health Aide) and Melissa (PTA) are the best!! Home Health Therapy plays an important role in the patient's plan of care. In addition to physical and occupational therapists, the home health team at Frontier Home Health and Hospice may include nurses, speech therapists, social workers and certified home health aides. Together they help patients maximize their independence and become as self-sufficient as possible. Home Health is a healthcare service that provides skilled care for patients with an illness or injury that make it difficult to leave home without help. Home health care is paid for 100% by traditional Medicare benefit. In addition, services can be paid by Medicaid, Veterans Administration, Workers Compensation, private insurance and/or private pay. Percentage of coverage depends upon the policy. Research has shown that home health therapy can significantly improve patient outcomes, when coupled with therapies for heart failure, diabetes, Parkinson's disease, stroke and more. << Click Here >> to read more. Call Frontier Home Health and Hospice at 307-332-2922 or 307-856-4127 to learn more about the benefits of home health and in-home therapies or to request a home health evaluation. You can also visit www.frontierhhh.com.